The Closing Ceremony for the Sydney Olympic Games was attended by an audience of around 110,000 people, and each spectator was presented with a kit that marked the occasion. Like the kits for the Opening Ceremony, these examples inspired a festive spirit and encouraged a degree of audience participation. They also referred to the icons and eccentric Australian images that emerged throughout the evening. Audience kit that consists of a polystyrene Esky that contains a plastic fly swat in the shape of Australia, a pair of cardboard glasses in the shape of the Olympic rings, a pin in the shape of the Sydney Harbour Bridge, a mirror ball key ring, a sticker, a limited edition ceremonies card, and Paralympics brochure. The audience kit was designed to raise a festive spirit for the Sydney Olympic Games Closing Ceremony and to encourage a degree of audience participation. 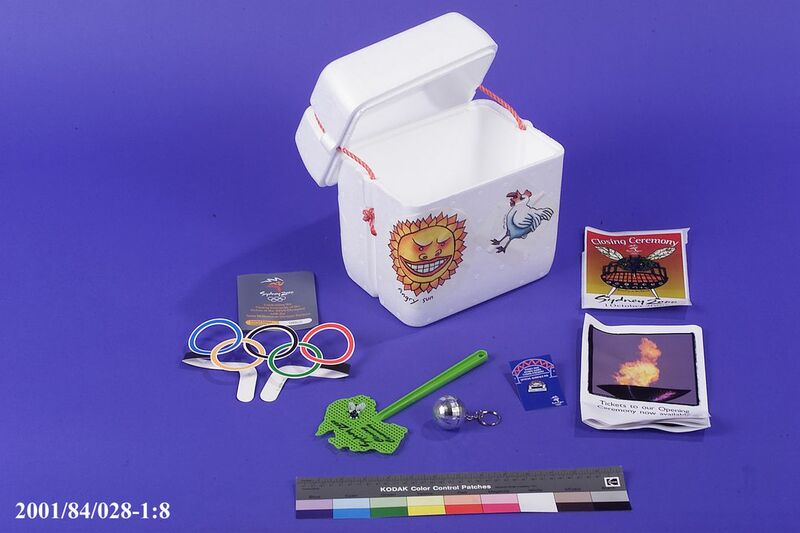 The key object of the kit was a polystyrene Esky - a symbol of Australian pop culture and a complement to the giant barbeque and blow flies that featured in the 'Heroes' segment. Its contents also referenced the icons and eccentric images that shaped the event. The audience kits were assembled in Sydney shortly before the Sydney Olympic Games Closing Ceremony on 1 October 2000. Though this audience kit has not been used it is identical to those that SOCOG distributed to audience members at the Closing Ceremony for the Sydney Olympic Games.